It’s safe to say that Wrong Ways Down is the best thing that happened to urban fantasy in a very long time. With this long-awaited, anxiously anticipated and rather longish novella told from Terrible’s POV, Stacia Kane gave her readers exactly what they desperately needed – a glimpse into the complicated psyche of a well-beloved character. If you know anything about Stacia’s books, you might have noticed that she doesn’t have almost-fans or lukewarm readers. People either hate or love her books, but for those who have loved the previous five novels, Wrong Ways Down will seem like a gift fallen from the sky. Not only do we get to see the inner workings of Terrible’s mind, but we get to see Chess through his eyes: a beautiful, confident and well-put-together version of her. Somewhere in the back of my mind, I was always painfully aware of Terrible’s insecurities, although it’s easy enough to forget them while seeing his strength through Chess’s eyes. 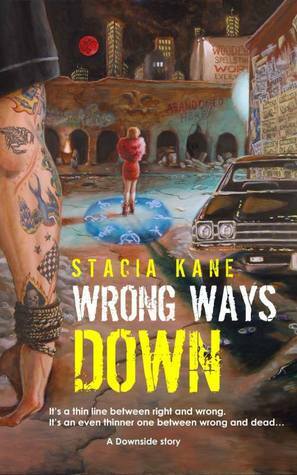 In Wrong Ways Down, Stacia Kane brings them all skillfully to light, thus giving a new and much needed dimension to a well-loved character. Suddenly, Terrible doesn’t seem neither untouchable nor invincible. He is as vulnerable as you and me, but all the better for it. And when he was doing it, using his fists, his whole body... he felt right. Like his body did the thinking he mind couldn't seem to get, and when he was fighting he thought faster than anyone else. If fists were brains he was the smartest dude in the city, and he couldn't help how that made him feel good. Terrible’s POV means that Downspeech is heavier than ever. Chess’s education is evident in her narration, as is Terrible’s lack of one. Stacia proved herself as a writer a hundred times over even before this novella, but for this, she should get a standing ovation. Everything about Terrible’s language was consistent and well-thought-out and Kane’s attention to details. I hope someone someday will write a paper about it, purely from a grammatical standpoint. I realize $4 seems like a lot for a novella (that’s the EU price, I’m not sure about US), but Wrong Ways Down is actually the length of a short novel, and brilliant to boot, so trust me when I say it’s money well spent. In addition, I don’t often see a self published work that is so well edited and has such a wonderful, non-generic cover. I don't think I've heard about this series before, but with your review you just made me want to read it! Adding it to the TBR list now! Ahhhhhhh! I NEED THIS IMMEDIATELY MAJA! I absolutely adore this series but I will admit I lost track of it for a while. I've read through book 3 but need to read the others and of course this novella. I love Terrible something fierce and am utterly fascinated by the way he talks, so I'm excited to spend time in his head. WOO HOO! I agree completely, Maja! I absolutely ADORED this one and it was so very perfect. I think one of its strongest qualities for me was that Terrible understood Chess on such a deep level - a level that I only began to glean insight into with the fourth and fifth books. And yet, this is in-between the first and second novel and Terrible already knows her so well. It really sheds so much more light on the kind of person he is and although I didn't think I could love him anymore, I now totally do. Lovely review, dearest - I must get around to reviewing this soon! You're killing me, Maja! Now I'm salivating over another UF. I blame you for turning this solid vanilla queen into a rabid UF lover! I can't decide whether to take the plunge or not. I have read the love and dislike reviews for this series and am worried the dark and gritty might be too much for me. I don't ever see five stars for novellas from you so this must be a good one! Wow! Usually you don't get such high praise for a novella. It is pricey (same in the US) but I do think I'll wait. Mostly because I have the first 3 and haven't read them yet. :) You have added this one to the wishlist though. Hmm, I think I need to pick up book one and it is so refreshing to hear about a good novella, lately they have been meh! Thanks for sharing this Maja..you have been adding to my reading pile all week! I haven't read this series just yet, but I have heard amazing things and your review has me anxious to get started! It's not often that I see 5 stars awarded to a novella! I still need to read the first book in this series, but you already have me more than convinced about Terrible's character. I'm glad that this novella introduced you to a new side of him. Great review as always! I haven't heard of this series until reading your review today - but Terrible sounds like a very well-developed character. I have to agree with Sam, it's rare to see 5 stars awarded to a novella! Thanks for sharing. I LOVE this series but I am unforgivably behind on it. Reading this review makes me anxious to pick it back up again and get lost in the world of Downside. Have you listened to any of these as an audio book? I love hearing how the narrator does the Downspeak. Oh Gods! I so need to get caught up so I can purchase and read this one! I sooooo need to get back to Chess and Terrible. *sigh* I miss them! :D Thank you!